I was looking through some food Blogs and I found Daily Bread Journal, which is a wonderful site. On this site Toni lists a recipe , Pork Chop with Lavender Butter, that sounded intriguing to me. I have never cooked with lavender, to tell the trough I had never tasted lavender either, so I decided to go for it. Of course like most food bloggers I am unable to follow a recipe so this one has my own twist to it. 10-16 oz of Pork scallopini, very thin cut pork loin. Heat Pan (I used Cast Iron) to hot while you season the pork scallopini with salt and pepper and dredge in flour. Add oil to hot pan to about 1/4 inch and let it get hot and ripples form. lay floured pork into hot oil and brown on both sides. remove browned pork and place on plate and set aside. once all the pork is browned pour off all the oil from the pan. Melt 1 1/2 TBS butter in pan, add onions and lavender. Saute until onion is toasted. Add wine and garlic, saute for another minute or more, till garlic is cooked. Add in the pork and for a few more minutes to heat the pork until heated through. When I first found food blogs (last November) I was intrigued and wanted to know what the hoopla was all about so I started a blog and asked, why. However, one person answered the question why and deleted it before I ever saw it. After pondering and looking through other food blogs I just started posting on my blog and I have come to love it over the last few months. even though I love it I could never really say why. Today I found a post on Nami Nami’s blog that finally answered the why in food blogging. On her happy 2nd blogger birthday post she really hit home for me and I want to say Thank you for putting into words the essence of food blogging. When ever we are going to go to friends for dinner my husband almost always asks me to make "that lemon tart" to take. Yes we all love Lemon Curd in our house but with 6 eggs and a whole stick of butter I try not to make if too often. Today we went to my friend Sharon's house for a BBQ and per my hubby's request I make lemon tart with an added kick, raspberry glaze. roll out one pillsbury pie crust and press it into a 9" tart pan (or you can use a pie pan if that is what you have) prick the bottom of the pie shell with a fork (if you like you can put beans or pie weights into the shell now, but I don't). Bake in the oven for 10 minutes. (remove beans if used) set pie shell aside. Put the eggs, sugar, and butter into a sauce pan and stir over med-low heat until sugar is dissolved. Add the lemon zest and juice and continue to cook, stirring constantly, until the lemon curd thickens slightly. Pour the curd into the prepared pie shell and bake for 20-25 minutes or until the filling is just set. let cool. for the raspberry glaze topping I halfed the berry glaze pie recipe and used raspberries and topped the tart with that. How would you go about taking a nice picture of a fried green tomato? I took maybe 30 pictures and not one gave a beautiful representation of a fried green tomato. So, her is the picture I chose to used, for all its worth. I found some nice firm green tomatoes at the market so I added fried green tomatoes to the menu. I first washed to tomatoes and sliced them into maybe 1/4 to 1/3 inch slices. Too thin they turn to mush, to thick they burn before they are cooked. I got 4 bowls and filled each with buttermilk, flour (with salt and pepper added), beaten eggs, and bread crumbs. I then heated a cast iron frying pan up, added oil to about 1/4 inch deep. I then took a slice of tomato dipped it in buttermilk then flour then egg and lastly bread crumbs. I put the tomato into the hot oil (I knew the oil was right because it bubbled when I added the tomato) and repeated with more tomato slices until the pan was full and I turned the heat down a little to keep them from burning. Turn the tomatoes when they are a nice brown on one side and drain on paper towel when the are brown on all sides. Season with a little more salt and enjoy. My Husband is from Serbia so I often try to make dishes that he grew up with or at least something close to what he ate growing up. This week my attempt at Serbian fare is Stuffed Grape leaves. The kids would not even try them but my husband loved them and I thought they were very good as well, this is my first attempt at stuffed grape leaves after all. 1. Heat oil and add finely chopped onion, cook slowly to soften. Then add the meat and cook until browned. Add rice, chopped dill, salt and pepper, mix well and cook together for a few minutes. Remove from heat and cool slightly, add egg and mix well. 2. Put a small spoonful of meat mixture on each grape leaf and roll into dolmas. Arrange them tightly in a pan; pour enough chicken stock (or water) to fill half way up the side of the dolmas. Cover and simmer over low heat for about 45 minutes, checking from time to time to be sure that the stock has not run dry. 3. melt butter in a sauce pan add flour and cook until light brown and nutty, add paprika pepper, and 1/2 cup stock and heat a few moments and add to dolmas, shack pan and add white wine and simmer for another 15 - 20 minutes or until rice is cooked through. * if you don’t have white wine chicken stock will work well. 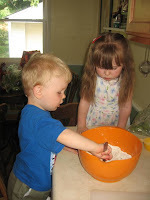 Sift the flour, salt, and sugar into a large bowl. make a well in the center and add the egg, milk, and butter and let set for 10 minutes. add a little butter to a hot pan and pour in about 2 T crepe batter and quickly tilt and rotate pan to cover the bottom in an even thin layer. cook for about 1 minute and turn and cook for another 30 seconds and remove. Continue until all the batter is gone. Serve with a good jam or as above. My Brother's Birthday is August 1st which happens to be during huckleberry season and he LOVED huckleberry pie and every year for his birthday our mom would make him huckleberry pie. My brother will be 30 this year and I plan to surprise him with the pie mom used to make for him when he was a kid. In a sauce pan bring to boil 1st 5 ingredients, cook until very thick, stirring constantly. Remove from heat. Pour into cooked pie shell, chill. About a year ago I made a recipe with fettuccini and bread crumbs and it was wonderful; however, I have know idea what recipe I made and I have been trying to figure it out ever since. This was good, but was not "the recipe"; however, it is worth a post. In a large pot, bring to a boil 6 quarts of salted water. Cook pasta until al dente. Meanwhile, in a medium-sized sauté pan, heat garlic in the oil until warm. Since the bread crumbs will cook quickly, you don't want to add them into a hot pan, otherwise they can burn. Add the breadcrumbs, walnuts and stir constantly. Season with salt and pepper. Sauté for about 2 minutes. Remove from heat and set aside. Drain pasta in a colander. Working quickly, add pasta to the sauté pan and stir to combine. Add Parmesan and mix thoroughly. Pour into large serving bowl and garnish with chopped parsley. I had picked up some fava beans at the market because they looked good. I took the beans out of the pods, blanched them in boiling salted water for about 1 minute. Stopped the cooking with an ice bath. Peeled the beans out of the outer shell and added them to this dish with the parmesan cheese. 1. Cut Chicken into this slices, about the size of a quarter. place in a bowl and mix with egg white and cornstarch. 2. Cut the asparagus into 1.5 inch lengths, set aside. 3. combine the ginger, garlic, brown sugar, rice wine, and soy sauce in a bowl and set aside. 4. Heat oil in a preheated, hot, wok. Add the chicken and stir-fry over medium high heat for about one minute. Remove with a slotted spoon. 5. Add the asparagus and green onion, and stock to the wok and stir-fry for about 1 minute then add the chicken and the remaining ingredients. Stir-fry for about one more minute. I think that this dish can easily be vegetarian by replacing the chicken with tofu, tempah, or mushrooms. In 1952 my Grandfather and Grandmother were married. There first dinner together as a couple consisted of sardine sandwiches, Grandpa thought this was an interesting meal for their first night as husband a wife, but ok. The second night for dinner Grandma served sardine sandwiches. Grandpa thought ok my new wife is very good at watching her dollar, this is a nice thing as newly weds. On the third evening they were married, you guessed it, sardine sandwiches. Grandpa decided it was time to ask. Do you know how to cook? My Grandmother's answer was no, not at all. So my Grandfather bought my Grandmother her first cookbook, and that cookbook was Modern Encyclopedia of Cooking, with the caption: "A modern cook book, complete in every detail, brings the latest development in home economics into your kitchen for a simpler, better and richer life". My Grandmother did learn to cook from this cookbook and if I remember correctly, she wasn’t half bad. A few years my Grandfather gave me that cookbook and I treasure it more then any other cookbook I have. It has all the basics you need to be a home cook in 1952, from how to pluck a chicken, carve a deer, or make a pie crust. Today I am going to share a little excerpt from the cookbook. When a Fruit pie is double or single crusted, lattice-covered or with a streusel top, the bottom should be as flaky as a top pie crust, tender and richly but not heavily browned. The fruit should no longer be raw, but should still retain its original form and have a natural lively flavor. There should be enough slightly thickened juice with a clear fruit color and flavor to keep the fruit moist and enough extra juice to flow slightly when the pie is cut. A thin, watery juice in a pie is difficult to eat, and both flavor and food value are lacking. Old-time good cooks rarely used any thickening in fruit or berry pies, but most of them used a little baking powder in the pastry. The addition of baking powder produced a thicker crust that was puffy and porous. The inside layers of such pastry absorbed some of the excess fruit juice, but the juice remaining was beautifully clear in color. The juice if these pies did flow some when the pieces were cut, and the wedges were not as neat appearing as they would have been if thickening had been used, but to folks who remember those pies, their eating quality has never been surpassed. One of my favorite things about having this cookbook is that I know what some of the families favorite recipes were from how stained the pages are. In a large bowl combine rolled oats and buttermilk and let soak for 15 minutes. Meanwhile stir together dry ingredients, add to oats and stir in egg and oil. cook on pan or griddle until golden on both sides. Serve with maple syrup or good jam. Nutrition, 1 6" pancake: Cal. 129, fat 2.5 g, carbs 20.3, fiber 2 g , protein 1g. stir, reduce over medium heat for about 20 minutes or until just thick. 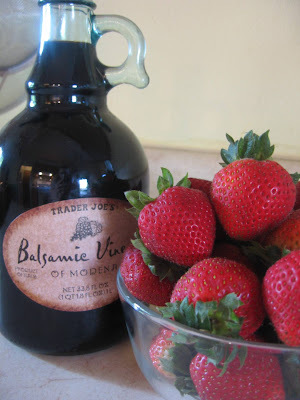 mix reduced vinegar with fruit such as strawberries. Serve with Walnut Olive Oil Cake. 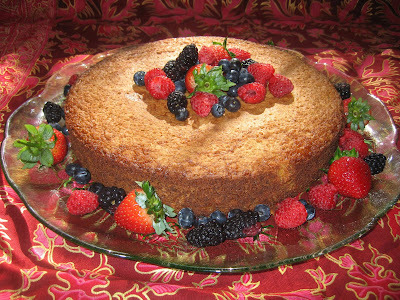 I started making this cake a few years ago from a recipe in one of my many cookbooks. Over the years it has evolved into what I am giving you here today. 1. Preheat Oven to 350. Lightly coat a 9" Spring form pan with olive oil. 2. Toast walnuts in the oven for about 10 minutes, cool slightly. Place walnuts in in food processor and process until they are the consistency of bread crumbs; In a bowl combine ground nuts, flour, baking powder, and salt, set aside. 3. Beat eggs in a large bowl with an electric mixer until frothy. Slowly add the sugar and beat until light, thick, and lemon color. Slowly add the walnut-flour mixture, beating continuously. Then, with mixer on low, add juice, zest, and oil and mix until just combined. 4. Pour into the prepared pan and bake for about 50-60 minutes or until a skewer inserted into center of cake comes out clean. Set pan on rack and cool. Remove cake from pan and place on serving platter. Serve with fruit in a balsamic reduction. Cooking in a parchment pouch is so easy yet I didn't try it until recently. I am not sure why I never tried it sooner, maybe the idea of trying to fold up all that stuff in paper and then putting it in a hot oven just sounded wrong. I finally tried it and it is a wonderful way to make fish that is moist and full of flavor with little work and easy cleanup. Preheat oven to 400°F. Cut 2 pieces parchment paper into 12-inch squares; fold squares in half diagonally and cut into half heart shapes. Open parchment; place the orzo on one side of each heart, place fish fillet on top of orzo, season fish with salt and pepper, lay lemon slices out on fish along with the rest of the ingredients.